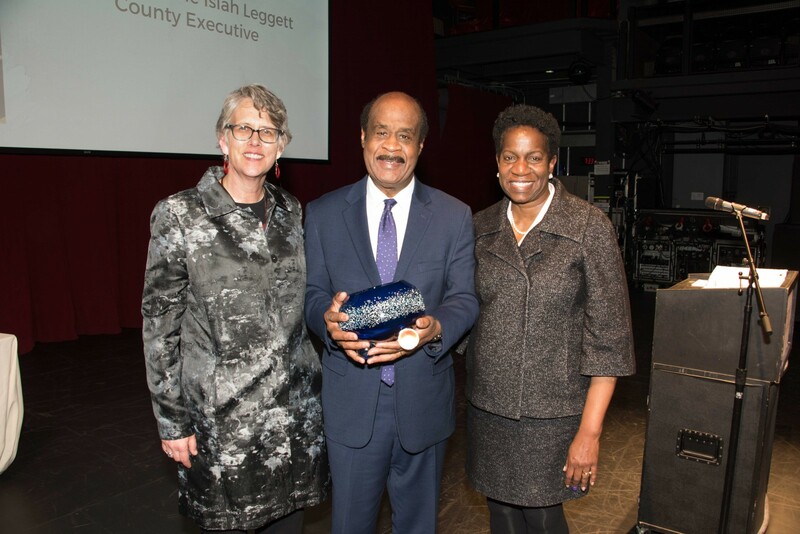 BETHESDA, MD—Marking its 35th year of fighting hunger in Montgomery County, Manna Food Center announced today it has honored Montgomery County Executive Isiah Leggett with a legacy award for his commitment to supporting the organization’s mission and strengthening the social safety net for county residents. (Left to right) Manna Food Center CEO, Jackie DeCarlo; Legacy Award winner, Hon. Isiah Leggett; and Manna Food Center Board Chair, Selena Singleton. Manna, the largest food assistance organization in Montgomery County, also named its 2018 Heroes Against Hunger award recipients, which include: Mead Family Foundation as Community Partner of the Year; Social & Scientific Systems, Inc. as Corporate Partner of the Year; and Ellen Teller of Food Research & Action Center, as Individual Hero of the Year. During the reception, Manna’s innovative programs and services were on display, including “Manny” – the nickname for Manna’s Mobile Kitchen and Pop-up Pantry. Manny is a transformed school bus that acts as a cooking and nutrition classroom for children and adults, and food pantry for communities with limited food access. The event caterer, Corcoran Caterers, is a member of Manna’s Community Food Network. Community Food Rescue employs an innovative web tool and mobile app to match surplus food with hunger relief organizations, in real-time. (Left to right) Jeff Miller of Jeff Miller Consulting Alliance (former Manna Food Center board member); Social & Scientific Systems, Inc. President & CEO, Kevin Beverly; Manna CEO, Jackie DeCarlo; Food Research and Action Center Director of Government Affairs, Ellen Teller; Manna Board Chair, Selena Singleton; and Mead Family Foundation board member, Stephen Mead. 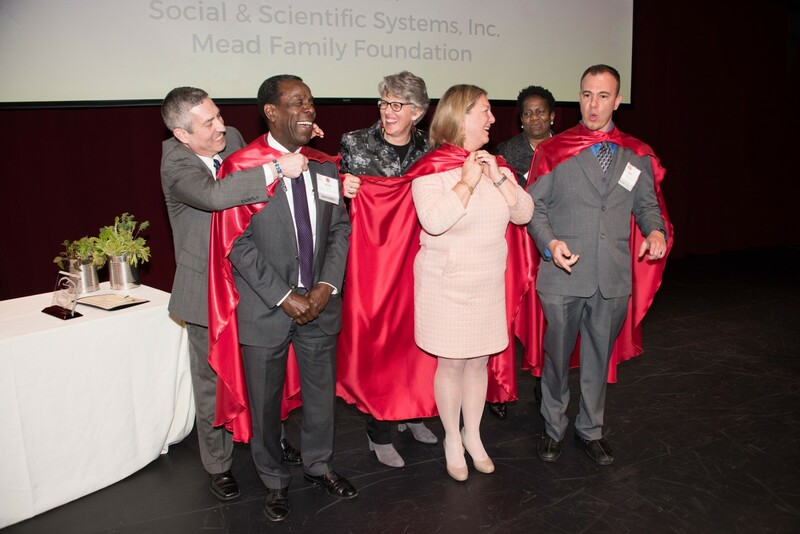 The Mead Family Foundation was honored for its role as a lead funder and catalyst for improving food access, education and security in Montgomery County and for strengthening nonprofit partnerships and collaborations around such efforts. The foundation supported Manna and many food security nonprofits in its history. Recently, the Mead Family Foundation provided direct service support, running a two-year Mini-Grants Program to build agencies’ capacity to receive, store and serve additional food rescued through Manna’s Community Food Rescue network. Social & Scientific Systems, Inc., which focuses on public health in this region and around the world, received its award for supporting Manna’s Smart Sacks program. The company’s staff team currently packs 70 bags a week for Greencastle Elementary, plus an additional 150 bags a week at Kemp Mill Elementary school in a weekend bag collaborative with Kids In Need Distributors (or KIND). Over the course of the year, Social & Scientific Systems staff will pack approximately 8,800 weekend bags to combat childhood hunger in our community. Award recipient Ellen Teller is the director of governmental affairs at Food Research & Action Center. An expert in anti-hunger policy work, Teller has worked closely with organizations and advocates across the nation, including Maryland and Montgomery County, fighting to strengthen anti‐hunger programs. She has also served her local community as member of Manna’s Board of Directors and Advocacy Task Force. Last month, Manna’s CEO DeCarlo was awarded Stop Hunger’s 2018 Women Stop Hunger Award at a ceremony in Paris, France. Under DeCarlo’s leadership, the agency has adopted a comprehensive approach to ending hunger through innovation, experimentation and community engagement. Stop Hunger is a global network of organizations working for a hunger-free world. The Sodexo Stop Hunger Foundation, headquartered in Gaithersburg, nominated DeCarlo for this award.